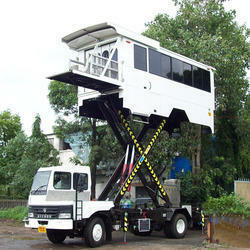 Our product range includes a wide range of hydraulic goods lift, ambulance lift and hydraulic tail lift (tailgate). Nandan manufacturers Hydraulic Goods Lift which is highly reliable and are custom made as per requirement and are designed for as small as 500 kg to as big as 10 ton. We supply hydraulic and mechanical goods lift depending on the suitability to the site. 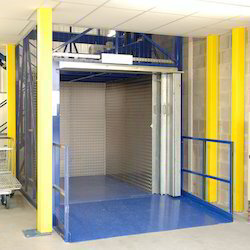 Nandan’s Hydraulic Goods lift can be installed without any lift-shaft or overhead room unlike a conventional lift. The use of synthetic spun web belt instead of wire ropes make it more safe robust and reliable. The mounting of cylinders, placing of power pack etc makes it easy for maintenance of the equipment. Nandan’s Ambu Lift (Medical Lift) also known as Medical Lift is used for the easy planning and deplaning of passengers who are incapacitated on wheelchairs or stretchers. These are made on commercial chassis and have a variety of customization that is tailor made for your fleet. The disabled passenger are taken on board with the Tail Lift at ground level to ensure the most safe and efficient serviceability of disabled passengers on wheelchairs and stretchers to and from the aircraft. For passenger comfort windows are provided for required brightness and light. We are the most renowned name in the service industry offering Ambu Lift to our clients, which ensure a safe movement of sick or incapacitated passengers. Built on a 16 ton GVW chassis, they have a rear hydraulic tailgate. With a Capacity of 2 stretchers or 4 wheelchairs, the operation is jerk free and the interiors are in ABS paneling which makes the body very aesthetically pleasant to sick passengers. Hydraulic Tail Lift (Tailgate) make it much easier to safely load and unload trucks and are synonymous with cost efficiency, flexibility and a high level of operating comfort for users. 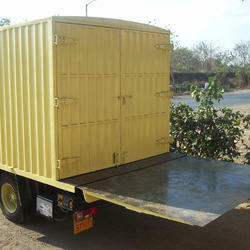 The Tail door of the vehicle is hydraulically operated through Power Pack to load or unload. The Door has two movements, Tilt Movement to come from Vertical to Horizontal Position or vice versa and Lift Movement to move upward and downward horizontally to the ground level. Food and Transport Logistics, Supply Chain Management, Waste Management, Emergency Services and Local Authorities as well as Leasing and Rental business.